Former Rangers manager believes the Colombian striker's value has dropped. 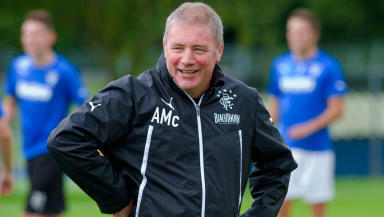 Ally McCoist believes clubs chasing Rangers striker Alfredo Morelos will be having second thoughts. 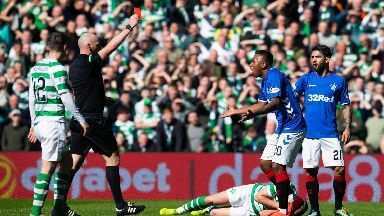 The Colombian has been shown the red card five times this season, and is currently serving a four-match ban after being sent off against Celtic. Morelos was expected to be the subject of some hefty bids himself this summer after a campaign in which he's scored 29 goals. But former Rangers manager McCoist believes the elbow thrown at Celtic captain Scott Brown last week will cool that interest. "Clearly he has let himself down and the team down too with his disciplinary record," said McCoist, speaking at Ayr Racecourse as he promoted this weekend's Scottish Grand National. "This could be the player of the year we're talking about, though, so it's a dilemma. "The number of goals he has scored this year has been great and some of his performances have been fantastic - but he clearly has a discipline problem. Steven [Gerrard] knows that. "I'm very hopeful he has learned from it, but the fact of the matter is that there will be one or two clubs who will have been put off by his disciplinary record and his value will have dropped a little bit."